If you were to visit the National Archives at Kew in London, and order file KV 2/27, you would receive a box containing some of the spy paraphernalia of German spy Josef Jakobs. Two small notebooks within that box would perplex you, as they have perplexed me for several years. You see, the notebooks were never included in MI5's exhaustive lists of Josef's possessions. The name of Kenneth C. Howard, repeated several times in the pages of the notebooks was a mystery. To date I have written two blog posts about the notebooks, musing on the identity of their owner, Kenneth C. Howard, and how he and his notebooks could be connected with German espionage. Alas, on previous visits to the National Archives, I had neglected to photograph every page in the the notebooks, so my speculations and theories were based on limited information. A recent trip to London has solved that dilemma. The first clue in the solution of the mystery was a tattered brown envelope with a stamp that read "One diary and one note-book containing suspicious entries. See B'ham City Police report dated 5th. June 1941". The notebooks were clearly collected by the Birmingham Police. This was supported by a stamp on the envelope which read "If Undelivered, Return to the Chief Constable, Birmingham". This was the envelope in which the notebooks were sent to MI5. Since Josef was never in Birmingham, the notebooks most likely originated with the mysterious Kenneth C. Howard. The Birmingham Police saw something alarming within the pages of the notebooks, something that was espionage-related and made them think that MI5 should see them. There was, however, no indication on the enveloped that the notebooks were associated with any particular spy. The next piece of paper was a note that essentially repeated the envelope information - possibly an MI5 note that accompanied the notebooks as they made the rounds of the Security Service. Finally, there was a National Archives curatorial card that repeated the information, but now linked it to a certain spy, PF 55039. This MI5 number referred to Josef Jakobs. So, somewhere between MI5 dealing with the notebooks and them being released to the public at the National Archives, a connection was made with Josef Jakobs. The diary was small and blue, made of faux-leather. It was dated 1936 and there were two sets of handwriting within its pages. One set had a well-formed script that was probably made by an adult. The second set was less well-formed and was probably made by a child. Many of the pages within the diary were blank, but several key pages are reproduced here. On the inside cover page, a childish hand had written the address of a Mrs. Wallace who lived on Fernbank Road in Llandudno, North Wales. On the next page, a more well-formed script gave the address of K.C. Howard, 128 Durham Road, Bromley, Kent, England. This particular address was repeated in the small black book (more on that in this blog post) but it was hard to tell if the shire was Hant. or Kent. After a few blank pages, the childish script entry for February 6 would definitely have aroused the suspicions of the Birmingham detectives. "Ship 'Nirvana' made water to No. I Hold at Malta". As far as can be determined there was no HMS Nirvana, so the entry remains rather cryptic. On February 8, a note stated "Sold 104 c/s f. Leaf Spinach @4/9 Rev Day(?)". A strange juxtaposition of notes that spoke not of cabbages and kings but of spinach and ships. Today my friend [indecipherable] Karl Theodore Druecke 30 yrs old, was today sentenced to 3 yrs imprisonment + 10 yrs Banishment. Karl Theodore Druecke was a spy who landed on the Banffshire coast in late September 1940, along with Werner Walti & Vera de Schalburg. Druecke admitted to MI5 interrogators that he had been sent to prison in France on May 13, 1936 for three years. This particular diary entry was the only one to make a clear link between the owner of the diary and any particular German spy. The entry for June 4 simply stated "Today is my Birthday". Blue diary - June 4 entry - Kenneth C. Howard's birthday? Towards the end of the diary, there were a few cryptic notes on the "Things Lent" page and then a list of radio station frequencies for various cities in Britain and Europe. Finally, there was an address section at the bank of the diary, several pages of which were missing. What then can be made of this small blue diary? In all likelihood, the notebooks were confiscated from Kenneth C. Howard due to the suspicious entries. Talk of ships and spinach, the mention of an incarcerated German spy and lists of radio frequencies were bound to look suspicious to police who had been encouraged to beware of Fifth Columnists. The notebooks were sent on to London, where the officers of MI5 would have flipped through the diary pages and stopped at the entry for May 13. Karl Theodore Druecke?? That was suspicious indeed! Most likely, Druecke would have been hauled in for another interrogation by Tin-Eye Stephens at Camp 020. The officers at the camp had been having trouble breaking Druecke and Walti, perhaps this little tidbit would help. "Who was Kenneth C. Howard? What was Druecke's connection with Kenneth C. Howard? Had he ever been in Birmingham? Speak now!!" Unfortunately, the Druecke files released to the National Archives were heavily weeded by MI5. All that remained was a thin, photocopied file, lacking any original documentation. In the few papers that linger, there was no mention of the diary, the notebook, or Kenneth C. Howard. Unfortunate. How the notebooks came to be associated with Josef remains a mystery, but not a serious one. MI5 did occasionally mix up evidence. One spy, Nicolai Hansen, arrived on a Norwegian boat in Scotland and was promptly arrested, his possessions seized and bundled off to London. By the time he arrived and was questioned by Lt. Col. Hinchley-Cooke, several new "trivial" things had appeared amongst his possessions that were not his. Similarly, Josef arrived with a Catholic medal that disappeared rather quickly from MI5's possession. At some point then, these two notebooks, originally linked to Karl Theodore Druecke were mislabeled, misfiled or mislaid... and ended up associated with Josef Jakobs. As for the identity of Kenneth C. Howard and how he came to the attention of the Birmingham Police, that remains a mystery. National Archives, Security Service file KV 2/19 on Karl Theodore Druecke. 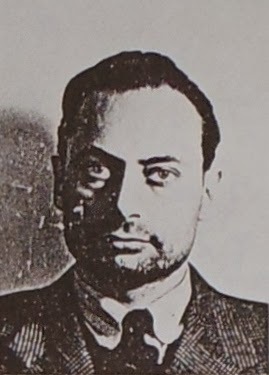 National Archives, Security Service file KV 2/27 on Josef Jakobs.